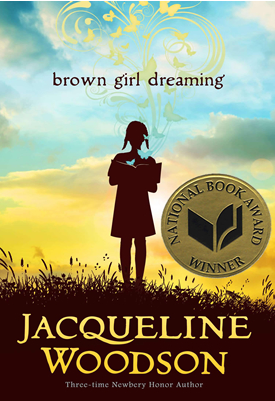 Thus begins Brown Girl Dreaming, Jacqueline Woodson’s memoir in verse about growing up in the U.S. in the 60s and 70s. or James’s—curled around a pen. The answer lies within the pages of Brown Girl Dreaming, a story about putting down roots and being uprooted, about having a dream, and about how experience fills children to overflowing. Only the oral nature of story comes easily. Woodson struggles with writing—and reading. Words jump around, twist and turn on the page. When she goes to the library, she takes out picture books, long past the time others tell her to read books that are more difficult. But that is the moment when serendipity strikes. Woodson makes a strong argument for the “We Need Diverse Books” campaign, doesn’t she? Now that Jacqueline is here, the day can finally begin. I hope that winning the National Book Award (for Young People’s literature – but I think everyone should read it) will give this marvelous creation the legs it deserves. You must excuse me, now. I’ve got to go read it again. You’ve convinced me I need to read this. I like sutobiographies, so this fits right in. How much those lines say in so few words! Yes, so evocative. Everything about this work, including the cover, is beautiful. It’s amazing to watch the awkward girl develop into the sure-footed writer who gifts us this book. I’ve got to read more of her work now. Thank you, Catherine! I can’t cay enough about this book. I wanted to pull out every wonderful line and put it in this post, but there are far, far too many. Thank you for the suggestion! I will take a look. Cheers! Sold. I will look it up! Yay! Then you can share it with your students!!!! Thanks! And yes, this is a lovely book, one I hope you’ll take a peek at! Although there is a chance that he struggles with some aspect of writing and simply isn’t fluent enough in the skill, making it arduous to want to write his stories. You can try recording him when he is telling a story. Yes, we (his teachers and my husband and I) are all working with him on various aspects of writing. It’s getting a little easier for him, but the recording idea is a great one! Thanks! Your grandson is one lucky kid! Oh my gosh…I love this book! The bits you shared were wonderful and I would love to read more. Truly beautiful use of the English language. Great review. Run, don’t walk to the nearest bookstore or library. 😀 You’ll be glad you did! So. My eyes did the teary, leaky, spouty thing at every quote. And then I headed over to Amazon’s look inside and discovered yes it is THIS side of the pond too. And i read some more, and wept some more and my heart went all huge, floppy and tried to get outside of my ribcage. So I bought it from a third party seller. And, now I’ve stopped weeping(so much tenderness in the excerpts, its like being dissolved from one’s edges) I shall need to make sure there are tissues a plenty for when the postman comes. Successs!!!! Oh, and you will breeze right through it (pausing for long moments to absorb the perfectness of a phrase or an image), and then you will go back for a re-read, and perhaps you will underline your favorite parts and think about them over and over again while you’re staring out the window or peeling potatoes with the peels falling like tears into the sink (to quote a famous poet from your side of the pond), and it will become part of your body and life everlasting. re: writing — I’m thinking you found your way past that problem, too! Please don’t be so harsh with yourself. Your reviews are marvelous! Yay! You won’t be disappointed! Thanks, Nick! I find it hard to believe that I haven’t read any of Woodson’s numerous other books. Time to change that. Wowzas, gonna get that book today! Thanks, Jilanne. I can’t wait to read it! Excellent review — your passion for Brown Girl Dreaming is definitely contagious! I am just beside myself at everyone’s response! Can you see two of me? 😀 I hope you enjoy it! Very powerful. It makes me think of I Know Why the Caged Bird Sings even though I haven’t read that in a long time. Yes! It’s been a long time since I’ve read Ms. Angelou’s work, but I think you’re right. Thanks for dropping by! Beautiful passages. So poetic and lyrical. I’m not familiar with this book, but I shall put it on my list. Kate, I think you will LOVE it! Enjoy! Thanks, Marsha! There are so many more beautiful lines, images, chapters, etc. in that book, it was difficult to select which few to share. I hope you have the chance to take a look at it. I don’t think you will be disappointed. Cheers! Jilanne, you read many children’s books. I have forgotten, are you a teacher? I had to do a project for a literature class once and read something like 100 children’s book and write a short review (much shorter than you read.) It was very helpful in my teaching career. No, I’m not a teacher. I’m co-chair of the library committee at my son’s school, and I volunteer during library time for various classes. I also write picture books and am submitting them to publishers. So I tend to read quite a few kids’ books as part of my ongoing education.